She would bathe daily in the blood of virgins. During the next decade, Elizabeth allegedly killed 650 young girls. History doesn't record whether it worked to keep her skin looking young. Finally, the people in the surrounding areas rose up and demanded that something be done, despite Elizabeth's power and wealth. Having no choice, local authorities arrested Elizabeth, and had her imprisoned for the rest of her life in Csejte Castle -- although she was never brought to trial. She was, apparently, batshit crazy. Blood has long been thought to have magical powers of restoration and vitality; thus the vampire mythos, and the hundreds of cultures that included blood sacrifice as part of their ritual beliefs. The scientific world has more or less shown this all to be nonsense, with the exception that keeping your blood flowing through your arteries and veins is pretty essential to your health and vitality. But this hasn't stopped people from believing that blood has magical powers, and there are still nutjobs running around who claim they're vampires, lo unto this very day. And this whole wacky belief system has given rise to a new "alternative medicine" fad: the "vampire facial." In this technique, which when you hear about it will make you wonder who the hell ever thought this could be a good idea, blood is withdrawn from your arm. It is then centrifuged to spin out the plasma and platelets from the red and white blood cells. The plasma and platelets are then injected into your face, in order to "stimulate new collagen growth," "get rid of wrinkles," and "revitalize the skin." 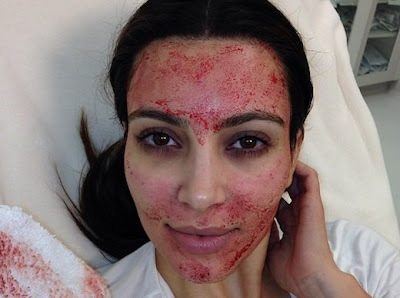 Below is a picture of noted deep thinker Kim Kardashian getting a "vampire facial:"
And if that photograph wasn't enough to dissuade you from ever doing this, allow me to add just a couple of comments about the procedure: You are (1) poking your face full of holes, and (2) injecting fluid into those holes. Of course your skin feels fuller. You are also causing inflammation, resulting in the production of histamines, causing swelling. So, okay, the wrinkles may go away for a while, rather in the fashion of pumping air into a flat tire, but as soon as the injection sites heal, the inflammation subsides, and the body reabsorbs the fluid, you're going to be right back where you started -- wrinkled, or, in the case of Kim Kardashian, dumb as a bag of hammers. Oh, and did I mention that the cost of the treatment is $1,500? Me, I think I'll just stick with the wrinkles, thanks. So, that's the latest from the world of alternative medicine and "beauty treatments." Every time I see some new thing arise on this front, I always think, "What will they come up with next?" And I'm never disappointed, because it always turns out to be more ridiculous than the last thing. Of course, the I-don't-want-to-get-old crew has yet to try out the Elizabeth Báthory method. I'm not sure why. Maybe it's because so many of them live in Hollywood, and virgins are hard to come by. I dunno. I'm in favor of anything that discourages virginity. By the end of the countess' run, they must have been having to import them from Spain.